Farum FC has established teams based in the two neighbouring towns of Vaerlose and Birkerod. Together with Stavnsholt (East Farum) the three teams form the North Zealand football league. As a result of localized recruitment and the filtering of juniors to the senior ranks the number of senior players have swelled to over 45 senior players and growing. Junior teams are also on the increase with the establishment of a junior team in Slagslunde, another neighbouring city and Farum Cats are in full swing with school clinics in the Birkerød area to establish junior teams at two age levels, under 12 and under 15. Recruitment is also underway for the next mini teams who are being primed for the next Geelong College visit in 2007. The Farum North Zealand league is unique to any other league outside of Australia in that clubs are required to have a junior development. Last year also saw the first visit by an AFL official when Ed Biggs made the trip to Denmark. Unfortunately the season was over but we had the pleasure in presenting Ed with our first class facilities and ground. Ed was very positive about the club and the development in the junior / school area. Our fantastic relationship and involvement with Geelong College is in no doubt the most important factor behind our strength and success in the school/junior development. Since 2000 Geelong College and Farum Cats have arranged tours back and forth four times in all with the most recent in September 2004 in which we hosted Geelong college for 3 weeks. Their tours to Denmark provide us with an exciting aspect and selling point in our introduction material to schools. We have had six separate schools involved in the tours in which they trained and prepared a school team to play against the Geelong students. It was last year’s tour that kick-started Ålborg FC’s junior development program. Schools find the international element of the sport very exciting and all have expressed strong interest in the next tour. This provides us with basis for an ongoing school tournament during their preparation for each tour. Farum Cats are now preparing for our next tour to Australia in 2006 for juniors between 13 and 15 years old. Again we will play matches against several schools culminating in the Ceramiboard Cup against Geelong College, which we have yet to win in the 4 previous attempts. Several exhibition matches will be arranged through the help of the AFL during the half-time break at AFL venues. The other highlight is visiting Geelong FC for a training clinic where the Danes get the chance to meet the senior cats stars, especially Tim Callen who Farum Cats officially sponsor. 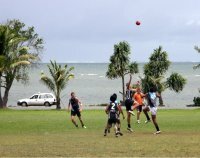 Two Geelong College graduates are currently based in Farum for a 6-month period for the purpose of promoting Aussie rules in schools, training juniors and playing for Farum seniors. David Burns-Wallace and Rhys Bennett (former Essendon fan) are employed at Marie Kruse school, where they are in the process of introducing Aussie rules to every student in the school. They are frequently invited to other schools in the surrounding area to hold football clinics. The boys are the perfect ambassadors, have adapted themselves very quickly and have had a very positive response in both the schools and club. In 2004 Geelong College hosted two juniors from Farum, Christopher Campion and Mads Buhl. Both have improved their football considerably during their stay and were thrilled to have the chance to meet Geelong captain Steven King. They are both currently playing senior football and work in the development of the juniors. April this year will see two more scholarship winners head off to Geelong for a two month crash course in Aussie rules. Jonathan Gelslev and Sebastion Torp will be hoping to learn as much as possible while training and playing at Geelong College. They also intend to see as many Geelong matches as possible. Geelong Football club give show tremendous support to our exchange students, our touring teams when in Geelong and to the Geelong College tours to Denmark. The juniors are looking forward to our next tour in 2006 and a chance to see the Cats live. We also hope to see Tim Callen and Jimmy Bartel out in Denmark at the end of the season, it was unfortunate it was cancelled last time. North Copenhagen Barracudas are on the hunt for a junior side as well. The past three weeks have seen 9 clinics for three age levels (three clinics per age level), with around 65 kids participating in total. It is hoped to have 20-30 kids playing regularly at the end of the year. Farum has been very helpful with guidance and support.